He was an outcast ace! The prey of friend and foe alike. From their hidden base in the Vosges Mountains, the crimson wings of the Red Falcon and his aide Sika fly once again into battle skies, waging a war of their own, doling out justice by the power of their blazing guns. 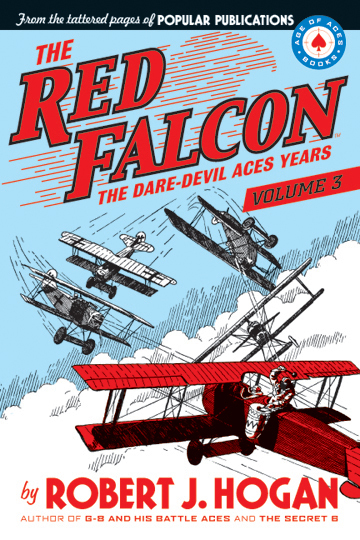 Robert J. Hogan’s Red Falcon flew through thirty-four stories in the pages of Dare-Devil Aces from 1933 to 1938. Age of Aces Books has gathered together eleven more never before reprinted air-action stories for this third volume in a series of four exciting Red Falcon collections. Also included is Don Hutchison’s look back at Harry Steeger, the founder of Popular Publications.